I was so moved by a sympathetic cemetery posting of a dog photographed while lying over his master’s grave that it motivated me to write this long awaited "Peace of Mind:"
His name was Rex, translated in Latin is king. As a Cocker Spaniel and Irish setter mix-bred Mutt, he was truly the “Emperor Of Affection.” Nicknamed Rexie, our family adopted him from an animal shelter. Truthfully quoted, it is said that dogs are emotional, give love unconditionally, and welcome it in return! There were times when no one else in our family expressed love and inspiration, but he would! I was assigned exclusively to be responsible for his well-being. I learned to whistle vary aggressively and loud to fetch him. When strolling from home I always carried a leach, but when he roamed freely out of my sight he would hear me shrill, and with his tail wagging always came cheerfully running back within view. Instinctively animals have extraordinary senses. So, because they don’t communicate verbally very well, for a variety of reasons, pets know how to request love and not only desire it, but thrive on it in return. They are our family and friends. Caring for and protecting them from harm is wholeheartedly absolute. I was thirteen years old when my family separated. I was placed in a children's home. I heard Rexie was getting older and due to his aging poor health, my wonderful friend had to be put to sleep. I was told over a phone call of his passing. Shockingly, like a lightning bolt that struck my soul, I couldn’t even say goodbye to my sister who informed me of the news, I dropped the phone, collapsed to the floor balled like a screaming infant and howled out his name in vain "Oh Rexie." He was special to me and it was painful that so much love had left my life. 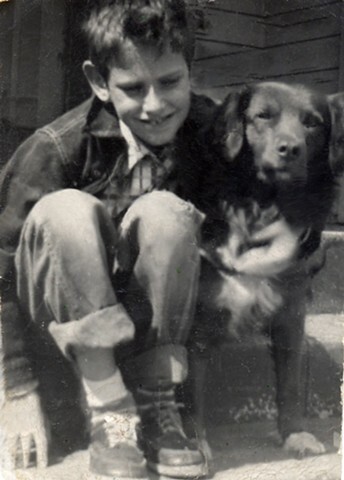 During that same period of time that my parents had divorced, I had sensed their lingering separation was coming, but it paled in comparison to the unexpected loss of the devoted friendship of my loyal companion that came to a mortal ending. If there is a heaven after life, I know he is waiting for us to rejoin again. In my heart I will always love my dear sweet Rexie! rvmann.com/artwork/3083758_Rexie_Back_I?